I have an obsession with shoes for toddlers. I must admit, shoes have always been my weakness. I have always loved shoes. To put it mildly everyone has some area of weakness right? As long as you keep it within reason, so let’s just call it a healthy weakness. I have told this story before on another page. Ever since I can remember I have loved shoes. Shoes make or break an outfit. It just makes you feel good when you have on a nice pair of shoes. When I was a teenager I would spend all of my babysitting money on shoes. I actually would put in a layaway full of only shoes….LOL, to be young again. I was an overweight child so I guess when I would dress nice it made me feel better. I knew that I would make sure that my child dressed nicely as well. You can find just as many adorable shoes for toddlers as you can for yourself. It will vary between girls and boys. I know that I am a very practical mom and you can learn how to save money while dressing your toddler. There are a few tips you will want to know before buying your toddler shoes. We can get caught up in wanting a certain look for our child, and realizing that the shoes may be a little uncomfortable for them. The right “Price, Comfort and Look”. It is possible to have the best of all worlds. It is possible to buy Nike toddler shoes inexpensively. Yes Moms this goal can be reached. So now let’s explore this farther shall we? Hello, this is a no brainer to me. They will outgrow their shoes so quickly you cannot spend a huge amount of money on their shoes, especially if they are going to have multiple pairs. Again I am a very practical mom and I will look for discount shoes whenever I can. I am the queen of sale racks and clearance racks. Now only you can decide how much you can afford to spend on their shoes. I have a whole page designated to finding great deals on shoes. You have to check it out and try them. They really work for my family. I will just give you a few hints about what you may try to save money. Clearance Racks and Sale Racks. Always be on the look out for deals. You can sometimes find bigger sizes then what you need. That is okay if they are a great deal, buy the shoes and save them. Eventually they will grow into them. I found a pair of Nike for my son for $8.00 on a sale rack. Put them in the closet and before you know it they fit. Sometimes when the store is low on a certain size they mark it down really low. So always be on the lookout for a sale. I save tons of money by doing this. Don’t forget about online methods. So now we have touched on price… just a little. You have to check out my discount shoe page to get even more priceless tips. Now we shall move on to comfort. As adults who can stand when we wear shoes that hurt our feet? I can’t even imagine being an infant or toddler who cannot express that their feet are hurting. :( I felt so terrible one time when JeNoah my three year old was an infant. He was 6 months old and I bought him these sneakers that were adorable. One night when I was putting him in the tub, I saw a little blister on his toe from the shoes. I could have cried! His little feet were too wide for the shoes. It is important that we buy shoes for toddlers that are comfortable for them. I can honestly admit that I just fell in love with those sneakers but unfortunately he could not wear them. It is not about what we like if it interferes with their comfort. 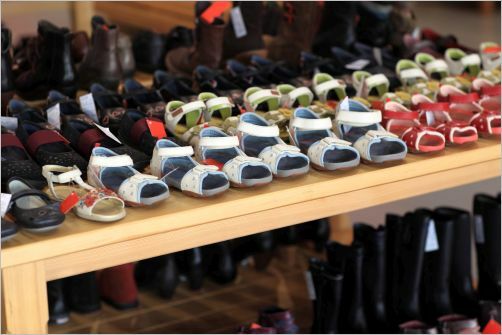 Have your toddler’s foot sized properly: You can take your child into a shoes for toddlers store and have their foot sized. That is the only way to have an accurate measurement. We can pinch the top of the shoe and attempt to do it but it’s better to get it done correctly. I have done this plenty of times and the sales clerks are always so polite and happy to help out, even if I am not buying shoes in their store. You will be pleasantly surprised that you may think your toddler is in one size when in fact they need a bigger one. So please just try to get a proper measurement. Their little feet are worth it. This is important, especially for those little ones starting to walk. They really need comfortable shoes. I know what some of you may be thinking. We are talking about shoes for toddlers, what does it matter how they look? I bet some of you are thinking that, huh? Well it matters to this mom and it always has. I care about how my child dresses and it matters to me a great deal. It is just as important as my son to get nice shoes as well as his parents. Speaking for myself, I am very particular about the types of shoes I buy for my son. I am not going to go into certain details because what I may not like, others may. We are entitled to be “picky” about what we want for our children. So keep that in mind when you are searching for the “perfect pair of shoes”. It is possible to get shoes for toddlers with a kewl look, great comfort and at an affordable price. Just put some extra effort in to saving money. Enjoy this time because before you know it they will be buying their own shoes. Discount Toddler Shoes can be easy to find. Learn my secrets on how to find great shoes and save money. Nike Toddler Shoes are the best. Learn why I recommend that your child wear this quality product.